Few things make me happier than tossing away the heels after a long day and slipping into something comfy. Lucky for us this season’s trend has comfort written all over it, meaning we don’t have to wait until clocking out to relax. 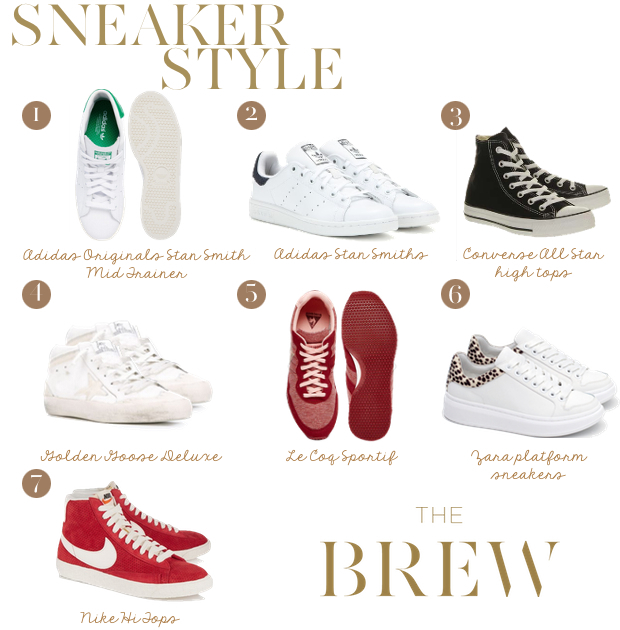 Our beauty and fashion editor, is sharing a few of her favourites from this winter’s lifesaver, the sneaker. So hands up who was outwardly pleased when sneakers made a major comeback?! Feet everywhere cried a delighted sigh of relief when the fashion for skyscraper heels was banished to the back of the wardrobe (now reserved only for the most special occasions) to make way for the every day, every way, wear of the humble sneaker. Seen on every stylish fashion editor and blogger these fabulous flats are here to stay and I for one am hugely relieved (as are my feet). They go with everything and make any outfit look effortlessly super-cool. You can dress down a pretty boho dress with any sporty styles, hi tops work particularly well, or partner a pair of tailored black trousers and a denim shirt for an easy weekday outfit. So if you haven’t jumped on the sartorial band wagon yet, here’s my pick of the best retro styles to add to your wardrobe this season, and don’t just stop at one! Here’s to keeping those feet oh-so stylish and always cosy this winter.